a) The coast line looks suspiciously familiar – just like home in Devon or Wales, really, including a driving rain and a sharp, cold wind. b) We really don’t fit in here. Everyone is up cleaning their vehicles! c) Even in daylight, the French don’t say hello. We get out of here asap. If you are wondering which campsite to avoid, here’s a link. Unless you are French with a very fancy campervan, that is! 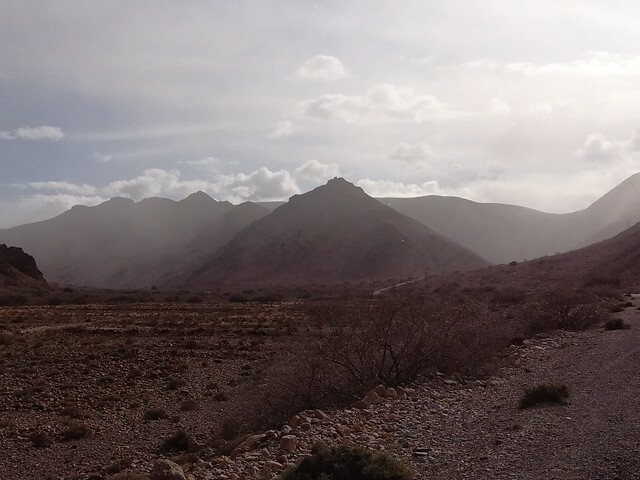 Next, we are heading for a national park just South of Agadir. Along a straight and fairly busy stretch of road, we pick up a Berber woman with a couple of large bags. She is the first female to accept a lift with us. We tuck her bags in the back and she climbs into the cabin. We have no common language between us, so it’s down to my rudimentary knowledge of Berber, but we introduce ourselves to each other and find out the basic family details of how many children and where they are etc. Again and again, she apologises for not being more clever, for not speaking any other languages, for not being able to write… walou, walou, she keeps repeating – nothing, nothing, while knocking herself on the head. However, I don’t get the feeling of a stupid woman at all, on the contrary, she seems quite clever in a feisty sort of way. We joke together despite the minimal amount of shared language. She shows us where to turn off to get to her village and as it’s not a big detour, we decide to deliver her home. When we drop her, she waves me into a shop and asks me to choose some sweets or biscuits, at pains to make clear to me that this is in payment for the lift but I decline. She doesn’t owe us anything, it was a pleasure to have her company for half an hour! Somewhere along the line, we stop to hunt for Ammlou. We’ve seen a sign for a women’s cooperative, so we are hopeful. However, it turns out not only don’t they have Ammlou, but what is supposed to be a women’s cooperative is sharply guarded over by a very unsympathetic guy who manages to create an oppressive atmosphere around him. He invites us to look at the women working but I decline. I have no interest to increase the women’s discomfort. Somehow his presence makes it be like looking at some zoo animals! We have heard about these ‘cooperatives’, ostensibly run by women but in reality reigned over by some guy. We get out of there as fast as we can. 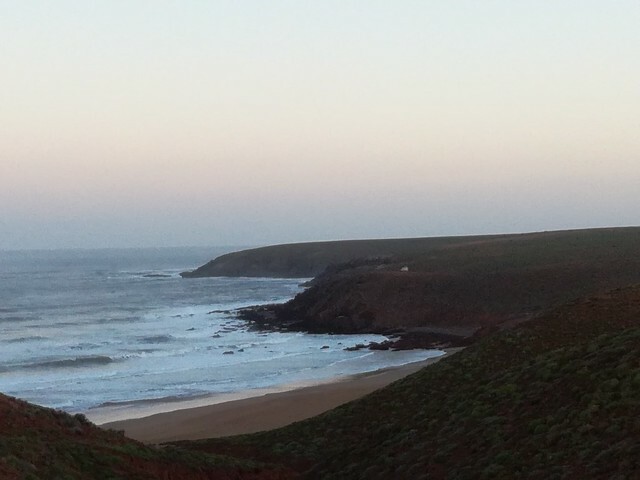 We wend our way through one or two more little villages before we arrive at La Dune, the campsite of Sidi Rabat. In stark contrast to last night’s camping, this is a small and very familiar, relaxed camp site. Every single vehicle is unique like our Emma, mainly inhabited by families. We settle Emma in between two lovely families, both of whom are seasoned travellers who educate their children on the move, and for the next few days, we feel quite at home in this little community of travelling families and very friendly locals. 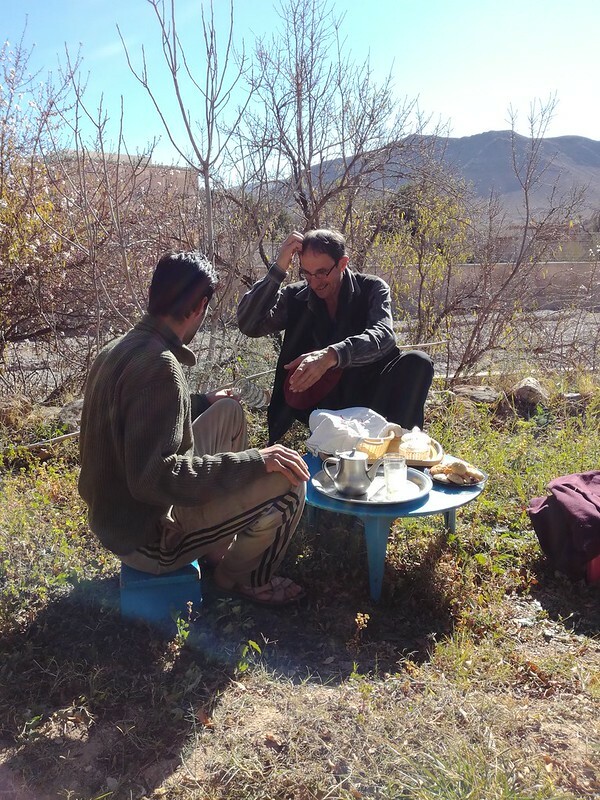 We instantly get swept into the camp site’s kitchen for a Berber tea and shown how to make a Moroccan-style cake and Tajine. There’s no rush to see our passports or get payment. Despite the rainy and windy weather (incidentally, the locals are delirious – it hasn’t rained properly in two years!!! ), we are drawn by the vicinity of the Atlantic ocean. On our way through Guelmin, we have lunch at a restaurant recommended by a local, where for 40 Dh Frank and I are fed lentil stew, bean stew and a plate of tripe ( Frank was expecting proper meat, but hey, when in Guelmin, do as the Guelminians do ;-), bread and water. All very local, including the price! From Guelmin, the road to Plage Blanche is a good 60km of almost no inhabitation, just rolling hills and the odd desert squirrel, a flock of sheep or a heard of goats, and some indefinable animal, something like an oversized brown guinea-pig, that pops its head out from behind rocks and disappears before we get a good look. It’s quite meditative, if not to say soporific, to drive through this landscape, with the gently rolling hills and the road gently winding – the sudden end of the tarmacked road comes as a bit of a shock. We turn left and rumble on for another 200 mtrs to find ourselves on an amazing cliff, exposed to the wind and the roiling sea, with a view onto an estuary and miles of sandy beaches. Behind us are a few army barracks but that’s the extent of human habitation. 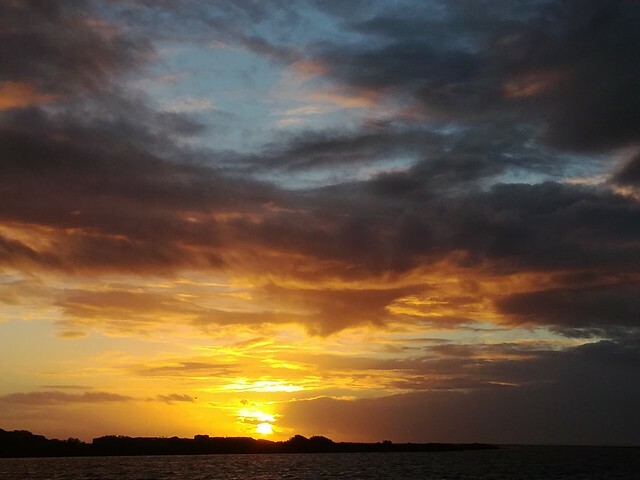 We spend 24 lovely windswept hours here, exploring the flora, chatting to the friendly soldiers, taking a long walk on the beach and enjoying a spectacular sunset. It is on Plage Blanche that Frank and I celebrate the fourth anniversary of the registry office-part of our wedding (February 1st – we are a few weeks behind in our blog!). What can I say – I have relished every minute of being with this precious man. What a gift to have found each other, to be sharing adventures, families, events organisation, and many more things. And however busy or crazy it gets, at the end of each wonderful day there’s a warm embrace in bed. For those who are searching and may sometimes resign to thinking that this kind of closeness and mutual love is just a fairy-tale, don’t give up! It does exist! The Moroccans really know a thing about tourism. Almost every campsite offers trips into the surrounding region. So far we have declined them, but Sala’s pitch is convincing, so for once we join the group of people who one morning climb aboard a rickety (but we are assured trusty) Landrover and set off. Ramdan, our 1.5-handed driver quickly shows that he exactly knows the width of his car as he passes walls and donkey carts at a hair’s breadth. Soon we leave the oasis out the back end and rattle off into the desert on paths that are hardly distinguishable as such. Our first stop is the Oasis’s river. We tumble out of the car to take in just how much lower the river is these days, as we walk across an old dam that was built by the French last century. Sala reminisces about the amount of birds that one could see then. Back into the Landrover and we rumble on for a while. Suddenly Sala says there are the camels! It takes us a while to spot them, they are quite well camouflaged in this landscape of brown tones and bushes. We stop to watch them by a watering hole. 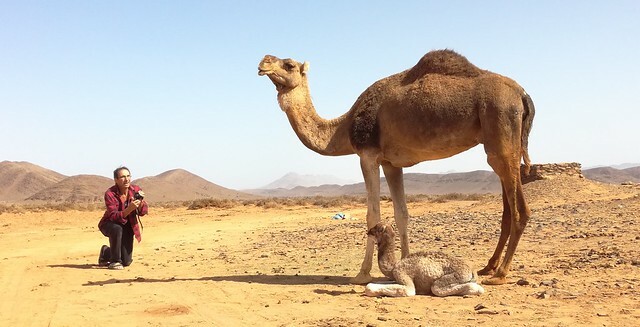 Some of them have ‘chastity belts’ on – baby camels quite happily drink from any available adult female, so their udders get covered. When they are milked, a bit is left in for the young ones to drink. Mothers with very young camels get separated from the group so the little one can suckle any time it needs to. 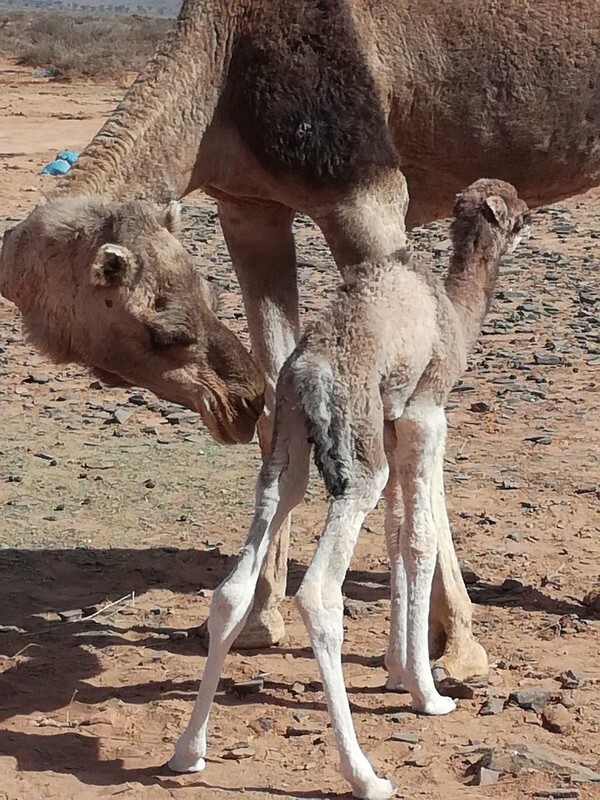 We meet one such very young camel – just a few hours old, it has difficulty getting up onto its long, spindly legs. Several attempts end up in a heap on the floor, but eventually it stands and takes some wobbly steps towards its mother’s udder, gently being nudged by her in that direction. Frank goes a bit closer to take some photos but is warned off by the deep growl and a sort of blubbery sound the mother makes as she gathers her spittle just in case. Our next stop is a hot spring. Some company drilled for oil, unsuccessfully, plugged the borehole and left. Some years later, the water, salty and rich in minerals, had corroded the plug and shot out of the standing pipe. Now it has calmed down to a gentle flow and the locals have dug a little basin around it, and at just over 40 degrees it’s like a really hot bath. Frank and I came prepared, so we don our swimming costumes and hop in. Hot springs can attract strange people, we’ve already seen this in the South of Spain. Here, an English man has taken a kind of guardianship of the spring, frequently ‘cleaning’ it by letting the water out and reshaping the basin, much to the annoyance of other users. Apparently he’s quite a barky type and has had a number of fairly serious clashes with several people, Sala being amongst them. Today he seems quiet, just sitting in his chair and watching the proceedings. Back in the 4×4 and on to the next site, where we walk around a little mountain that is the focal point for a nomadic tribe. 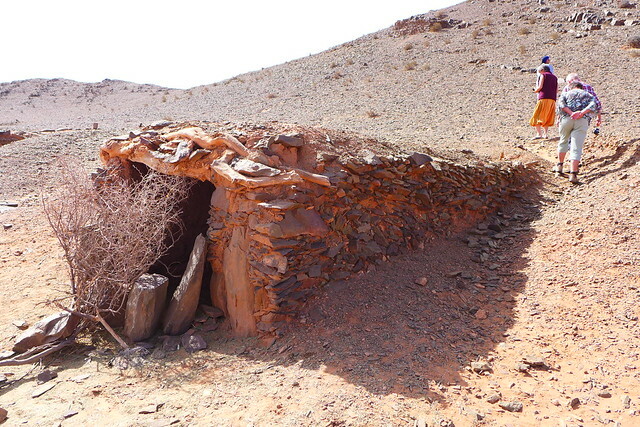 We see some ancient grain stores and hear how the nomads may stay here during the planting season and till, sow, grow and harvest their grains, stash them away in these underground stores, close the entrance with sticks and stones and move camp, leaving their harvest behind. It would be easy to break into one of these stores, but stealing is seen as such a bad activity (and used to be very heavily punished – now it ‘just’ lands people in prison, but previously people would lose a limb) that the food is safe until the family returns. We pass an old cemetery and Sala tells us that someone (probably a foreigner) dug up one of the graves and found a whole load of treasures. He throws a stone into the middle of the cemetery to mark where the grave was robbed. Again, I muse, how come not more graves are robbed if people know there may well be treasures buried there? Sala shrugs his shoulders. We have a lot of respect for the dead. We don’t even enter a cemetery, let alone think of digging something up. The picture above shows the cemetery. Small stones for children, large stones for adults. Grouped in two denotes a male, a single stone denotes a female. The building in the background is for someone of high standing in the community. According to Sala, this would be someone who was knowledgeable and contributed to the community through sharing his knowledge. Our next stop is lunch with Hassan, a nomad who grows organic vegetables in his compound in a little village called Tadalt. This garden is a little paradise, so green and luscious in the middle of an arid landscape. Apparently, water is quite easily available at about 5 meters depth. 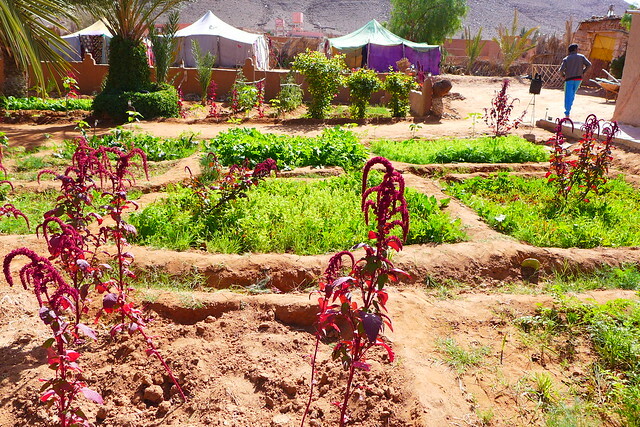 There are a couple of buildings, one for the kitchen and one for the toilets, but apart from that, there are tents and a lot of open space to grow vegetables. It seems that for a Nomad, houses are for storing food but not to live in. Those red plants in the foreground are aptly named Turkey’s noses! We are served a delicious couscous with vegetables from the garden before a local guide takes us for a walk around the village. 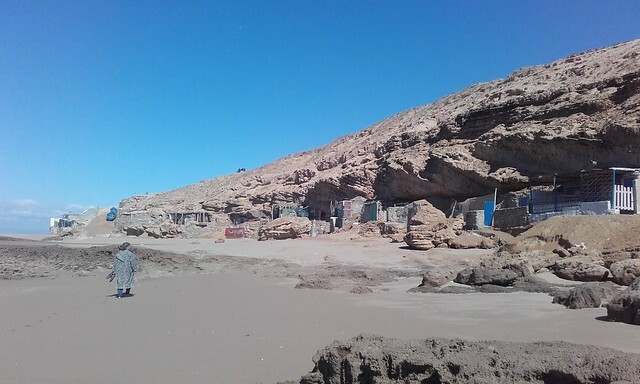 It looks quite deserted, but we are told it used to be thriving, with about 500 inhabitants. 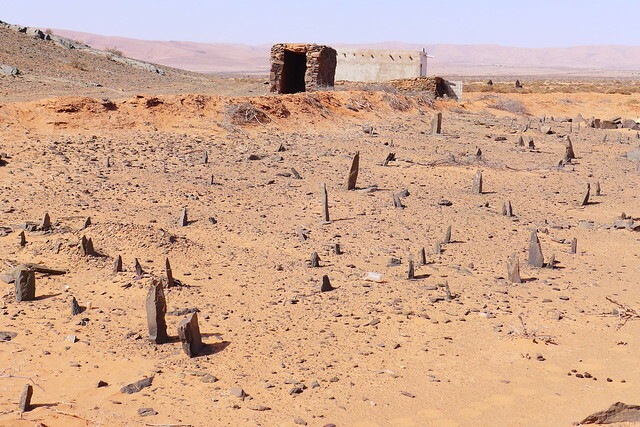 Then one day in the 1980ies, King Hassan II decided to relocate the whole village to Layoune, some 800km away – he needed people to populate disputed territory near the Algerian border. The military arrived unannounced and loaded everyone into buses. About 20% of the population managed to hide with their livestock in the mountains when the military came, and they still inhabit the otherwise deserted village. Why did the people not try to get back from Layoune? I wonder. They were offered everything there, good houses with water and electricity, education for their children, good health care etc. In the end, it didn’t matter too much to them where they lived, as long as they were well. Once the children were in school and a planting season had got under way, people were more likely to stay. But families got split? Yes, my brother lives in Layoune, I haven’t seen him since he left. 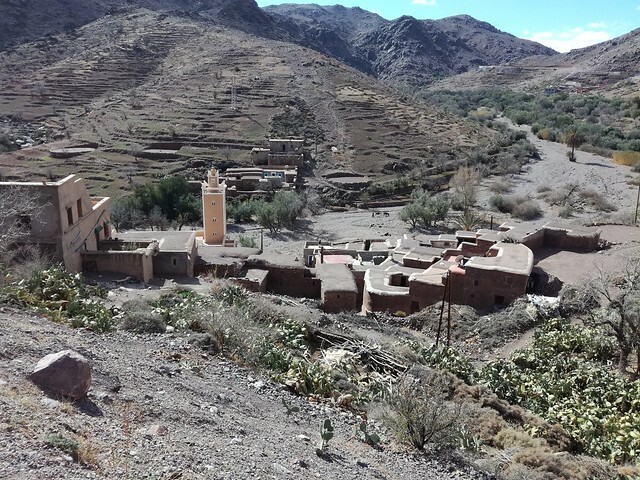 Our guide seems to have picked out Frank and me as the ones who might be gullible or crazy enough to buy his family’s 500 year-old tumble down Kasbah, or what remains of it, to be precise. I’d say he has a good eye; out of our group, we probably are the ones most vulnerable to this idea. So he tries to tempt us by showing us how the Nomads used to hide treasures by incorporating clay vessels into the walls of houses. He points out some of the hidey-holes and hints at many other potential places. 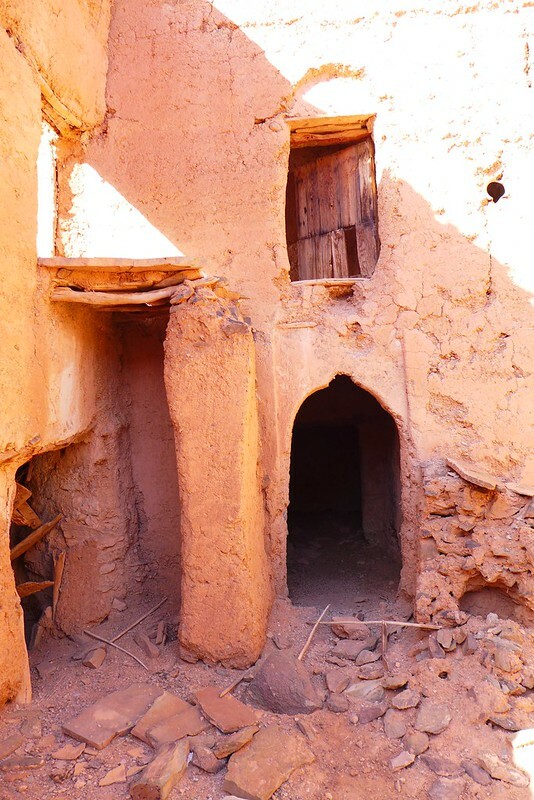 He tells us that some Italians bought a Kasbah in the village, purely to hunt for treasure, found lots and then left again. And, I think just in case we are crazy enough to maybe even consider living here, he points out two wells, one at each end of the property. Paperwork is easy, he says, just a bit of Bakshish and the thing is yours. It’s practically a gift! 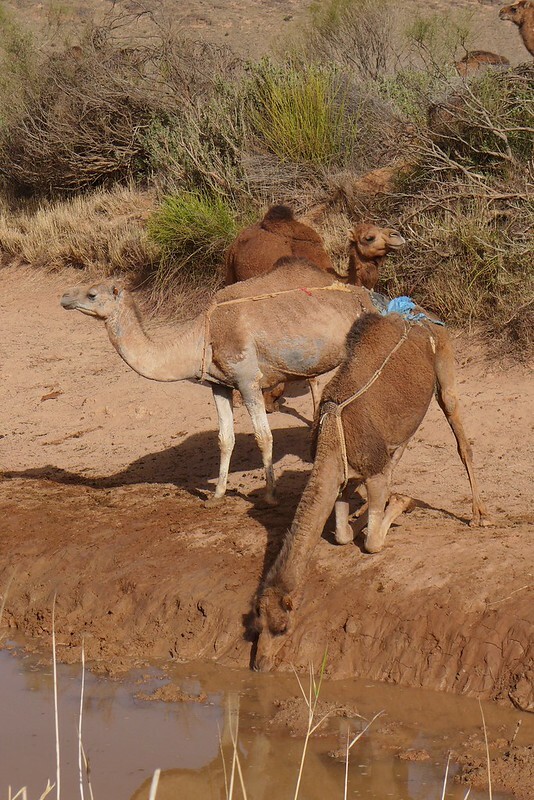 When we get back to Hassan’s, Sala has woken from his siesta and together, we head off to our next destination, a few sand dunes snuggling in between two black mountain ranges. It’s not the same, going to a place like this with a group of people, as when I’m on my own – I don’t get the same feeling of peace and quiet – nevertheless, I manage to break away and capture some more beautiful photos of the play of sand, wind, light and shadow. I love how the wind creates such a sharp line of sand on the top of the dune. Our last stop of the day is a kasbah that has been turned into a museum. A large and jovial Berber awaits us. 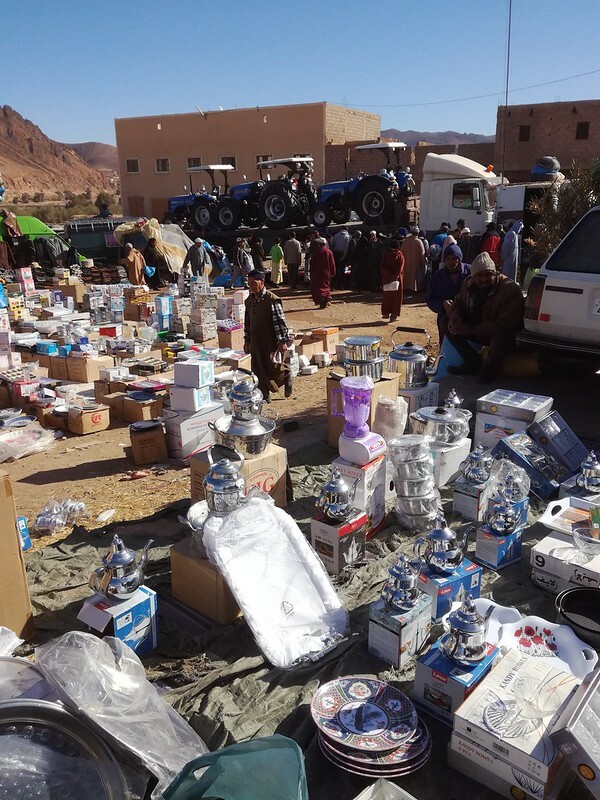 There’s no electricity in the kasbah, so we all turn on our mobile torches to view an eclectic collection of household items, furniture, clothing, agricultural tools etc. Explanations are punctuated by appreciative hollering and clicking sounds from the guide himself. In the last light of the day, we are shown into Berber tent in the courtyard where a whole lot of jewellery is for sale. Now it’s up to us to make some appreciative sounds but without necessarily indicating the wish to buy. When we return to the campsite, we are well tired, but what a day it’s been! That night, I wake up to the most unusual sound of rain drumming on our roof! 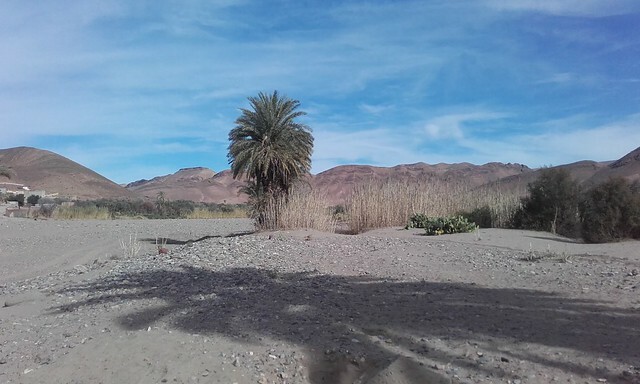 We move on to an Oasis called Tighmert (near Guelmim), where the Camp site Aain Nakhla is run by Sala, a Berber who returned to his roots after having spent 18 years working in Germany. This campsite has a different flavour to any we’ve ben before. Every evening, there is an invitation to come and sit by the fire (or, if it’s windy or rainy in the berber tent) and share stories and music. 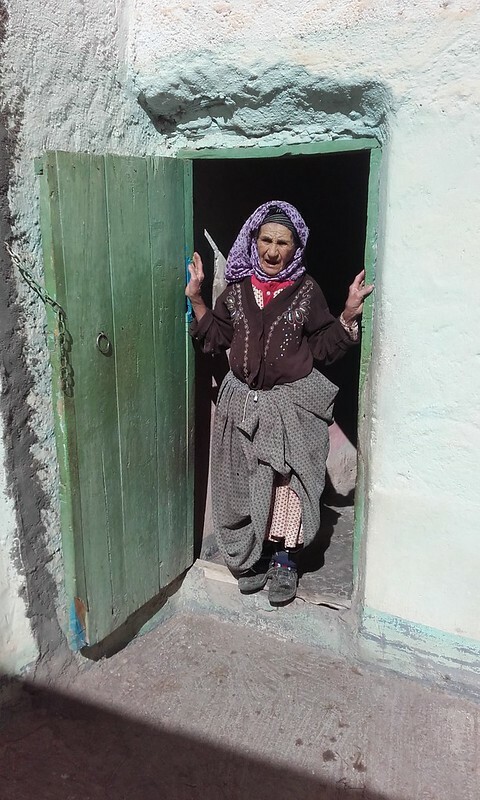 Sala has many friends in the village, some still from his school days, and they like to drop by if they know they can do a bit of the Berber dancing – a strange version of moshing on your knees. The guys kneel as close to each other as possible and then fall into a trance-like, rough sideways sway, while singing and clapping. Someone will play a drum, but they don’t need anything else for this to take off; just a group of friends and some cushions to soften the wear on their knees. Even the young ones are taking part and really throwing themselves into it. Compared to that, our European contributions are quite tame… during our stay, there are several guitarists at the campsite, sharing their repertoire from the likes of of Crosby, Stills, Nash and Young. Ali hitches a lift with us as we leave the campsite one early Saturday morning to go to the Camel Souq in Guelmin. We have a couple of things we’d like to buy and he promises to help us find them, but once we are there, he seems quite eager to make his own way and we are really quite glad to be left to our own devices. The early morning sun warms us as we are strolling through the animal part of the Souq. 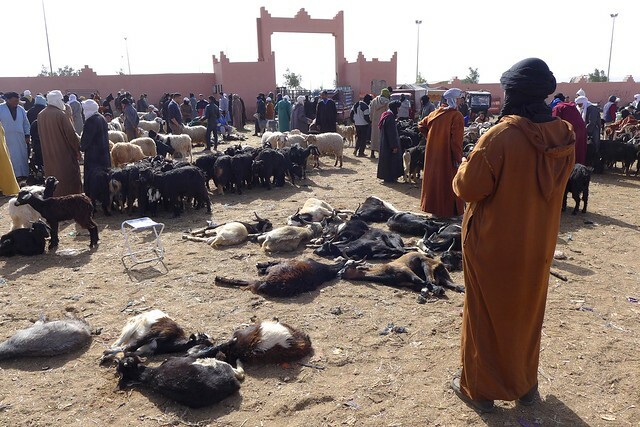 This could be complete mayhem – camels running around freely and plenty of sheep and goats about, but it’s actually quite calm. Many of the goats and sheep are hobbled, some of them so much that they are lying on the ground, watching proceedings from below with a worried, beady eye. This market isn’t too crushed with people, but I’ve seen others where the poor goats’ heads come perilously close to being trodden on, and understandably the beasts were shaking with fear. Here, it looks more like a slightly unsettling resting position. 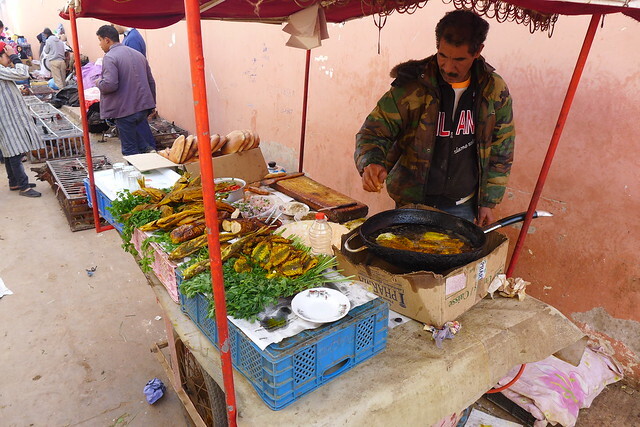 It’s breakfast time, so we are on the look-out for one of those stalls that deep-fry fish deliciously in copious amounts of Moroccan spices, before sticking them inside some flat bread and heaping on some Moroccan tomato and onion salad. Once suitably reinforced, we shop for our vegetables and beldi lemons (Bergamots). We also are on the lookout for Amlou, but can’t find any that doesn’t contain sugar. We’re also on a hunt for an electric cable, but those at the Souq are all of ephemeral quality, so we decide to stop in town on our way back home. Today is the opening day of the Six Nations, so Frank spends the rest of the afternoon in the berber tent, watching two rugby games in succession, while I get in the writing zone and catch up with blog chapters. Sala comes with us until we need to turn off Southwards. We drop him in a vibrant, little village where we stock up with food, knowing that we are about to take another stretch of road less travelled. 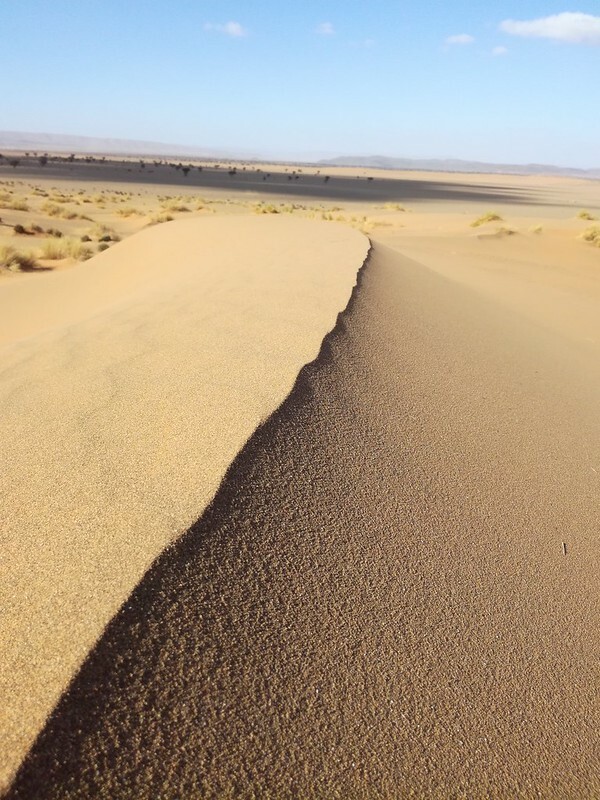 Over the next few kilometers, the landscape slowly flattens out and returns from rugged mountaintops towering over layers of fertile terraces, to more undulating, light-brown arid hills. We stop for lunch in a quiet, isolated valley amongst a plantation of young pine trees. Instead of a siesta, I decide to climb up the hill in the midday sun. It is very quiet here, but there is a light sussurating sound… like a car approaching. It takes me a while to realise it’s the wind going through the surrounding pine trees – a sound I haven’t heard in a while. Finally, the road completely flattens out and we’re back in desert landscape. A battered old road sign promises a hot swimming pool with 39 degrees heat and I wonder if it is some kind of hot spring, so we turn off and bumble 16km across rough tracks to arrive in Abaynou. There is indeed a hot spring here that feeds two gender-separate swimming pools. We are lucky though, as Thursday night is mixed night in the women’s pool. Rachid, a friendly young local points us to a place by the side of the village where we can park up for free. Once again, we have a conversation warning a young man off the idea of going to Europe. We also leave him with an idea for a hot composting business; something I would certainly do if I were to move here. There is a proper camp-site further up the valley, which I come across on a cycle ride the next day, founded by a Swedish woman called Britta Elisabeth Dancy. It is one example that shows how one can make lush gardens in this inhospitable environment. There are many trees and some birds I haven’t seen before. However, I’m not tempted to stay at this site – it looks too exclusively plastic-fantastic, mostly french, and the manager seems to be quite gruff. I’m glad I came on a recce by bike instead of shlepping Emma across 2km of rough piste. 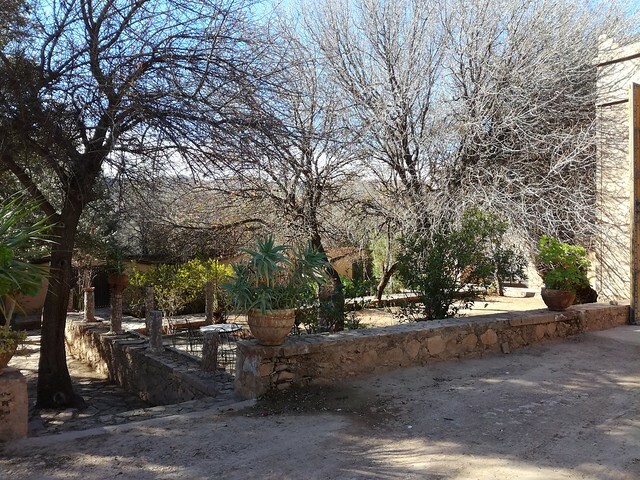 We take a walk through the Oasis of Abaynou. A flash flood wreaked a lot of havoc six years ago, sweeping across the oasis and destroying many houses. Only half-hearted attempts have been made at rebuilding since then… we find a sadly neglected Palmeraie and there is a lot of debris in the river – in stark contrast to the many unusual metal signs we see about a local initiative called ‘the society for renewable energy Abaynou’. When we ask Rachid about this later, he has never heard of it, despite spending much of his working day standing right by one of these signs, as he directs cars to the various car parks available around the swimming pools. The hot spring experience is a lot more prosaic than I expected it. At the entrance, you get a washing basket to put your clothes in and then you descend to the swimming pools past the showers (defunct) and the toilets (working, but no light). The water smells as if it’s rich in iron and it is comfortably warm but not really hot. It’s ok, but not riveting. The weather suddenly changes – a strong wind picks up and there is a silvery grey atmosphere that makes even nearby mountains look hazy. We don’t really know what this is – it doesn’t look like rain. It is cold enough for snow to fall, or maybe this is a kind of sandstorm? The change of weather has knocked us out a bit. Frank is in bed once more, nursing a cold and I use the time to catch up with our blog and admin. It would be great for nature if there were some proper rain. 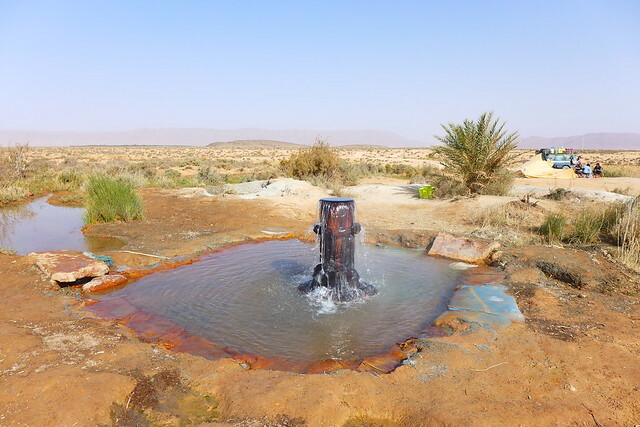 The oasis of Tafraoute looks well parched, although some farmers are hopeful and have ploughed their fields in readiness for water. One day I take a walk through the oasis. 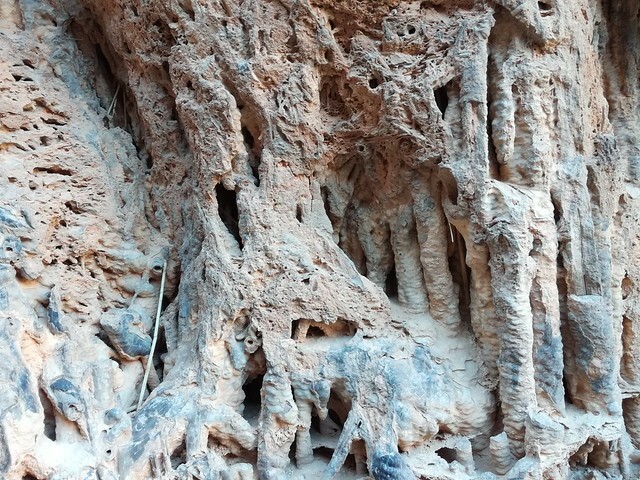 The rock formations are different to anything we’ve seen in Morocco so far. 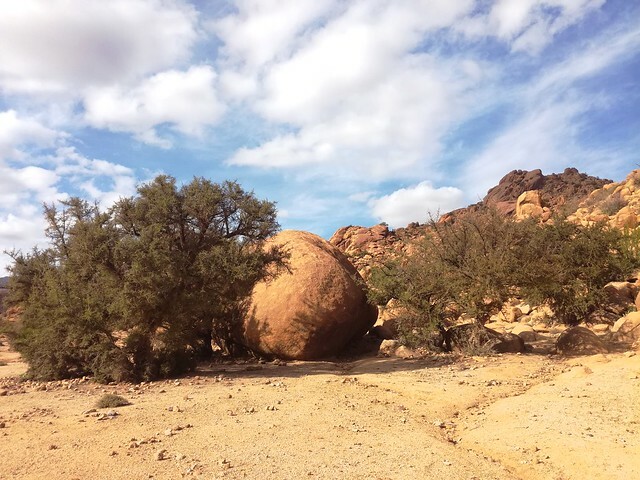 Huge boulders lie around in between Argan trees, as if the gods have been playing marbles. The shops in town sell Argan products at hefty prices. What has really taken our fancy though is Amlou, the most delicious almond paste I’ve ever come across. We buy a big pot and eat it on fresh flat-bread, with a smattering of Frank’s Lemon and Bergamot marmalade on top – yummy! Here’s a photo of Frank on an early-morning stint of ‘marmalading’. 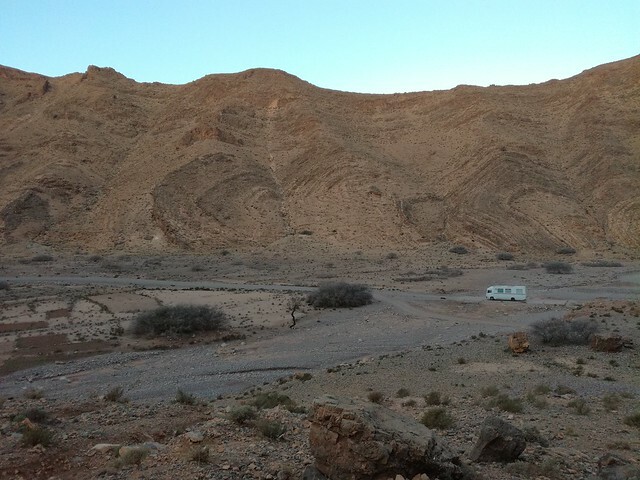 Near our campsite, there is a large open part of the Oasis where many campers have parked up. It’s quasi wild-camping, with a man from the commune passing by every day, charging 15 Dh, but for once I’m not keen to join the wild campers and I can’t put my finger on why that is so. 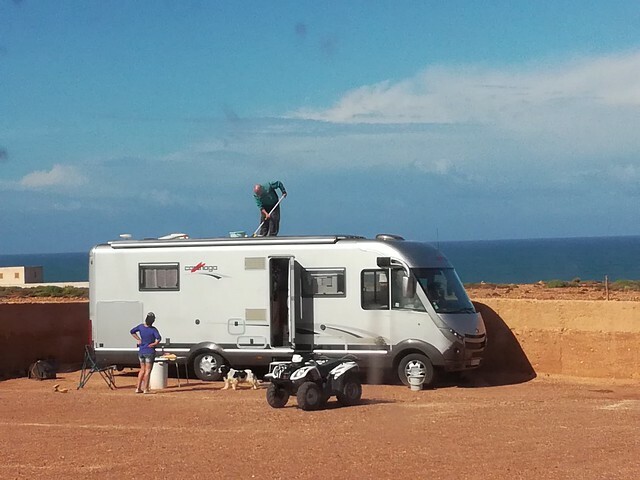 The front of the campsite is dominated by French campers, of the ‘plastic-fantastic’ variety, while the hippies have spread out several hundred metres into the Oasis. There would be plenty of space to park up in between and not be bothered by anyone, but somehow this place gives me the creeps. As soon as Frank is well enough, we get out of here. 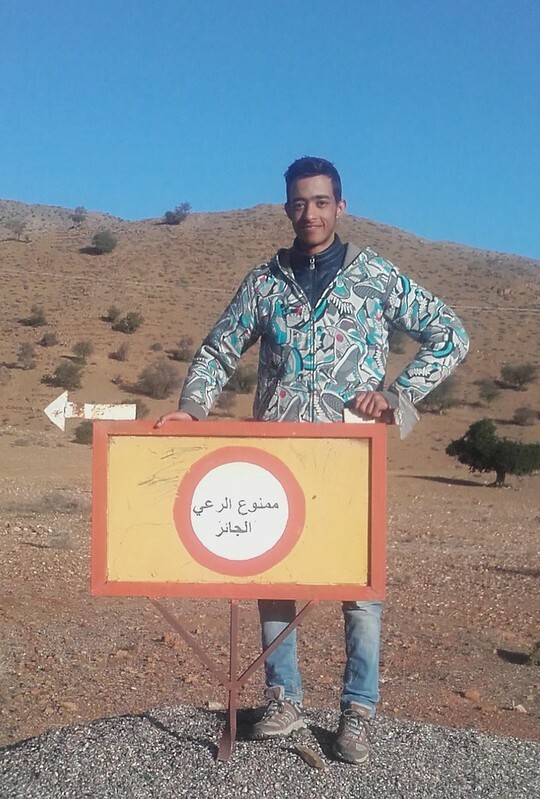 About 20km from Tafraoute, we pick up young Sala who is hitchhiking back home to Agadir. At age 22 and an economics student in his final year, Sala says he’s a bit confused about what he wants to do with his life. His English is surprisingly perfect, considering he learnt it mostly from films. As with so many young men, his view is towards Europe, but he listens attentively to our warnings that Europe will not give him the reception he dreams of and for once, our encouragement to find his vocation here in Morocco seems to fall on fertile ground. As we drive along chatting, the landscape suddenly opens up and we decide to stop for the night – tonight’s moonrise is special, it being a super, blue-blood moon and we appear to have found a perfect place to see it from. As the light fades and we light a fire in Emma, a shepherd passes by with a very well nourished heard of sheep and goats. 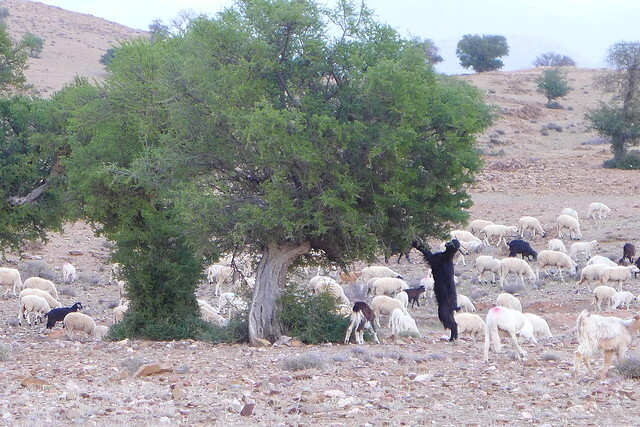 Some of the goats obligingly stand on their hind legs for Frank to take the photo of ‘goats in Argan trees’ that he’s been looking out for, ever since we came into the area and found a crumpled postcard depicting such a scene. 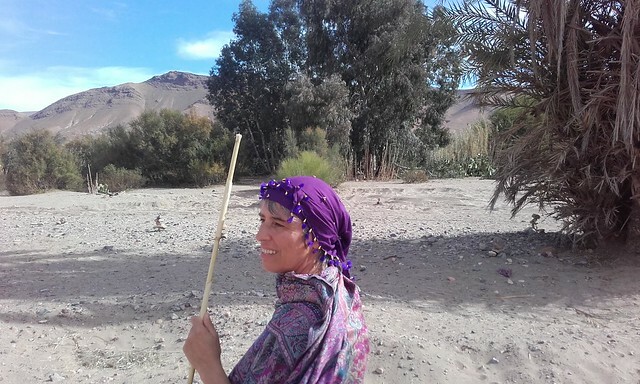 The shepherd has a lovely, bright-eyed smile, but communicating with him is difficult – he only speaks Berber, which we don’t. Nevertheless, we somehow show him our appreciation of the good-looking animals, and he nods proudly. This is a young man who seems very happy with his lot in a rural, isolated landscape, looking after his herd all day. He doesn’t seem in any hurry to abandon his life here and find another one in Europe! The moon indeed makes a spectacularly bright appearance, though sadly we are not in the right part of the world to witness the eclipse. We get the first inkling by an otherworldly hue on the underside of clouds, and then the moon climbs over the mountainside, spilling its milky-white light across the landscape. 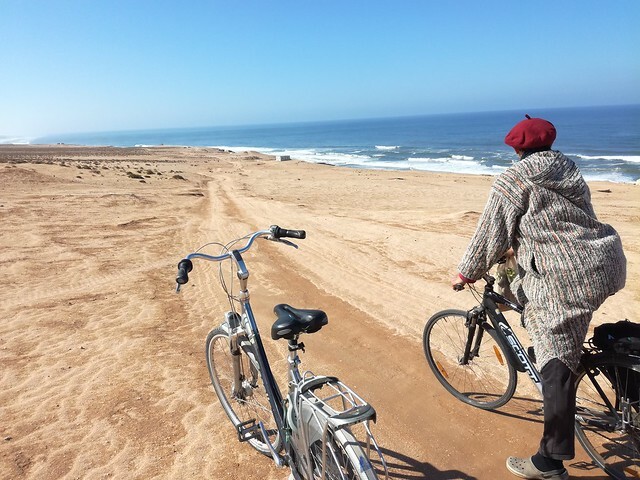 We invite Sala to stay for dinner but he wants to hitch another lift, having run out of money and needing to get back to Agadir. However, the sun has already set and after a little while Sala reappears at our door, glad to accept the dinner invitation, having found a little cave under an Argan tree where he has spread out his rolymat and sleeping bag for the night. We share a lovely evening exchanging stories. Sala is inspired by our campervan life. When he leaves, we give him one of our hot water bottles for the night and arrange to continue our journey together after a good night’s sleep. The next morning we share our last bits of bread and leben with Sala and drive on with the sun on Emma’s back. It’s been rather cold recently, so we are keen to go further South. 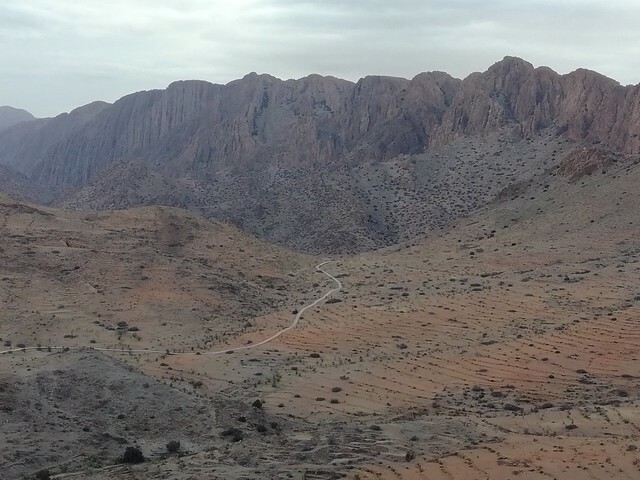 There’s a minor road on our map that leads to Tafraoute from Taliouine, right across the Anti-Atlas and we feel ready for more adventures off the beaten track. For two days, we enter another stretch of breathtaking, jaw-dropping landscape, as Emma slowly winds herself up into the mountains. We stay overnight on a disused bridge (one part of it having been washed away and the road having been re-routed), in a very silent valley. 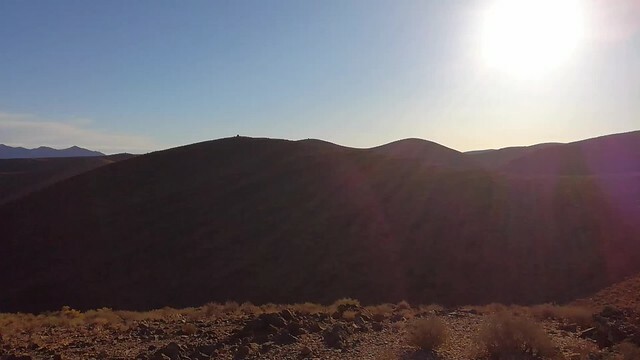 Next morning, I go for a strenuous scramble up the mountainside to be rewarded with a 360-degree view for many miles, the snow-covered peaks of the High Atlas mountains visible in the north and a dusting of snow on the Anti-atlas too. In Igherm, we catch sight of some freshly-baked Brioches in a café window. While enjoying them, we chat to the waiter, who lives here but has his sights trained on Europe. (As with all the young men we meet, we try to dissuade him and tell him that right now, Europe will not give him the welcome he expects). 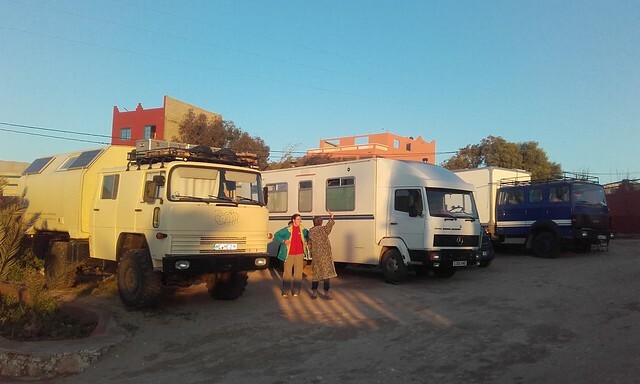 He comes to look at our van, and once inside and sure that the door is closed, for the first time in Morocco, we hear a voice critical of the King, whose decisions, he says, are sometimes driven by personal or financial interests and not for the benefit of his people. After Igherm, the land seems to become more arable, with many little villages and intensively maintained terraces high into the mountains. It looks like I imagine a Chinese landscape to look like, with very steep mountain peaks towering over layers and layers of green terraces. We see people dressed in very colourful clothing, often on an underlay of black. There are embroidered shawls and wraps with bright tassels and extraordinary headgear. We stop at a souq somewhere high up in the mountains and go out in our jellabahs, much to the delight of the local population. They lean over backwards, laughing at us. I wish we could take more photos to show you how they look like though, but here as everywhere, there is a strong reticence to be photographed, so we refrain. You’d never get an English person laughing at someone in this way, yet, it is such an innocent laughter that I would trade it any day for the thoughts that a northern European person might hold in private. At the top of the mountains, we enter another plateau. Fields of Almond trees at I don’t know what height, maybe 2000m, before the view opens to the next mountainous valley and our road zigzags down amidst the most spectacular rock-faces. 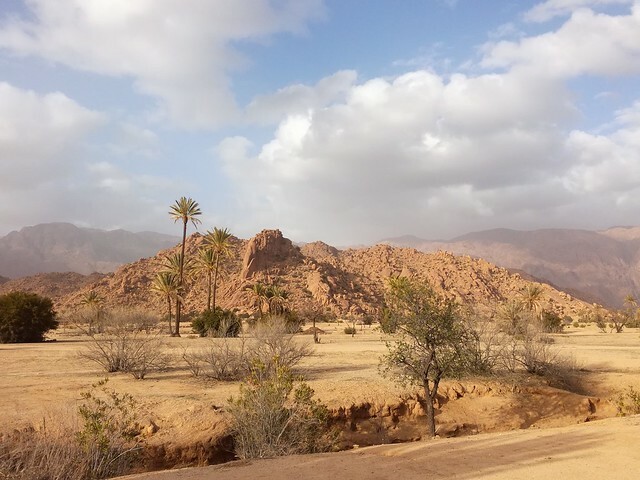 We have arrived in Tafraoute. If we hadn’t smashed our window, we would never have come across this wonderful little paradise of a campsite! We receive a warm and relaxed welcome from Ali, the manager, who promises to help us find someone to repair the window. The next day, he brings a young and taciturn man who has a good look and goes way again, only to return some hours later with a piece of metal which he proceeds to insert into the space where once there had been a window. It’s not an easy job and at times we feel like he’s taken the wrong measurements, but he persists and eventually it slots into place. We are impressed by his tenacity and workmanship, except for the way he drips silver paint onto Emma. It takes him the best part of the day to repair the window and he only charges us a 100 Dh – we give him 140. Now Emma has a little silver blind window – it’s like she’s had her first dental filling! Ali shows us around the campsite. 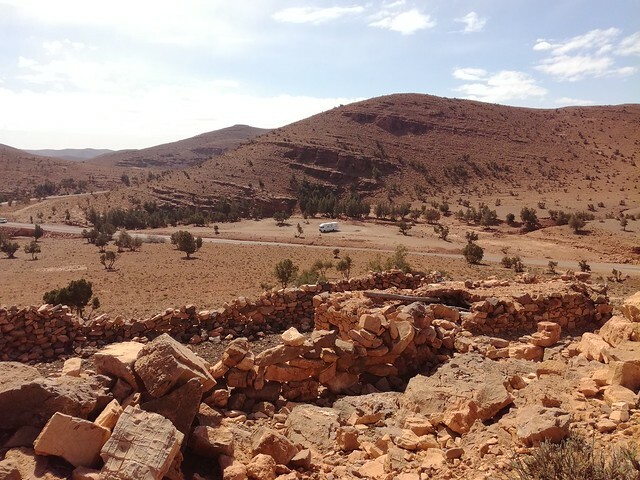 There are some Berber tent-style huts for simple accommodation. The shower has a wood-fired boiler (and is fantastic! ), there is an enclosure for animals (but it’s empty except for a couple of little dogs), and there are a number of incredible trees, some of which are of a local species that is now rare. We meet Ahmed, the owner of the campsite, a few days later and he says they are called Atlas Pistachios. They don’t bear fruit but the resin gets burned for special ceremonies. Ali tells us that Ahmed is thinking of selling the campsite, as well as a nearby, walled plot. He shows us both and for the first time in our 4 years of travelling we are seriously tempted. This seems a very special piece of land in a lovely village and we consider what it would be like to run this place, while also maintaining our lives in the UK. Looking at the campsite, our imagination runs wild. It will need quite a lot of TLC, having been just ticking over for a number of years, since the death of Ahmed’s son who was a great tour guide and involved in maintaining the site. But this lack of attention is probably what attracts us, there’s lots to do to make this place sing again. Plus, in combination with the other piece of land, there really is room for expansion. For a whole 48 hours, we mull over the possibility of buying it. We dream about chickens and gardening, about going to the local souq on a donkey, and then we wake up one morning clearly knowing that now is not the time to do this. We are too deeply involved with life in the UK in general and with our children in particular. While we travel, we may be physically absent, but we have a lot of space and time to be in touch with them. If we were to take on a project like this, our headspace and energy would be fully taken up, and it’s just a bit too far away from the UK for anyone to just ‘pop over’ and visit. We meet Ahmed once more to tell him of our decision and leave him with a suggestion that maybe we could come back next year and stay for a month, giving some of our time and energy to improve the place and maybe help him with a ‘rejuvenation’ project. Ahmed must have liked our ideas, because after offering it to us, he’s adamant that he will only sell his precious piece of land to someone he feels will appreciate the place and continue to respect what he’s built up. We like him too. He’s unusual and we share a few personal life stories before we bid him a heartfelt good-bye. Even though we don’t want to buy this particular one, thinking about it has clarified some ideas about the possibility of owning/running a campsite. Ahmed’s place, an Auberge with rooms, is on the other side of the river from the campsite, so after visiting him, we decide to walk back across the dry river bed. We enter quite a magical place; a forest of silver-barked trees, maybe some kind of poplar, is followed by all sorts of bushes and plants we don’t recognize and there is a particular type of silence here. I can imagine this to be baking hot in the summer, with snakes languishing in the hot sand. At the campsite, there’s a young man, Abdulatif, who helps looking after the campers. One day Ali and Abdulatif get it in their heads to cut back the trees, but they make a real hash of it. Ahmed is shocked when he comes to view the results. Abdulatif is a farmer, so it’s really surprising that he doesn’t know how to prune trees properly. One morning, Abdulatif invites us to come for breakfast at his house. We meet his 80 year old mother, as well as some really ancient animals; a 37 year old cow and her calf, and a 40-year old donkey called Ariel. The house is a huge Riad – Abdulatif and his mother appear to rattle around in its vastness. The very traditional kitchen with wood fired ovens for cooking and baking seems curiously at odds with a modern, two storey-high building, where an undercover courtyard gives on to many rooms on two floors. 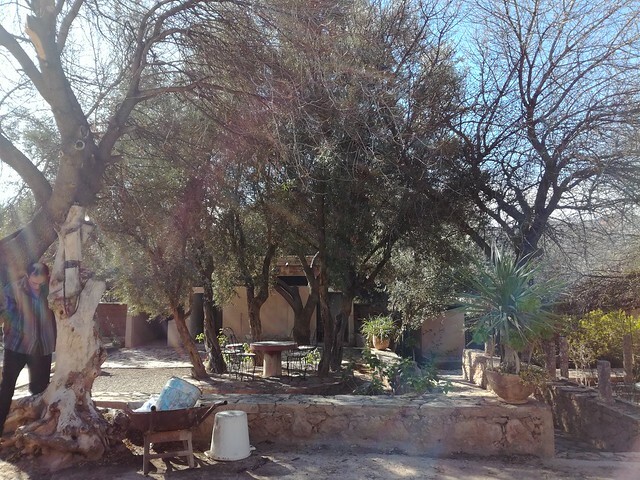 There’s a magical garden too, with all sorts of fruit trees – figs, almonds, lemons, olives and bergamots. The almonds are in full blossom and the garden is humming with bees. Abdulatif brings out delicious, freshly baked flat-bread and Amlou and of course ‘Berber whiskey’ – the strongly mint and absynth flavoured tea, sweetened with piles of sugar, and we sit under the trees in the morning sunshine, discussing life in Morocco and Abdulatif’s plans for the future. 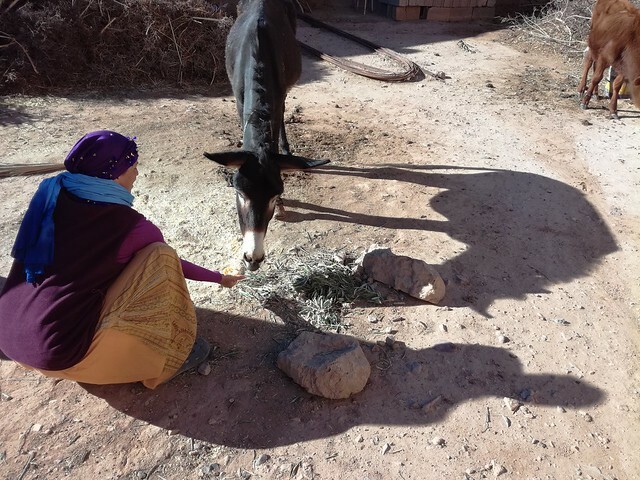 One evening, we hear the tell-tale sounds of another Berber wedding in the village, but we are still chewing over the experience of our first, so we pass on this one. That night there is a light snowfall! The temperatures really see-saw from day to night here – it can be up to 25 degrees in the day and then snow at night! I wonder what that does to the almond blossom? One day, Ali lets water into the campsite and for a few hours, we hear the happy gurgling of a stream rushing through the Azequias, gradually filling the flower- beds. That night, we hear the extraordinarily metallic sound of a toad, right next to our van. Despite feeling so at home in this camp site and village, eventually we have our last wood-fired shower, fill Emma up with water, bid a hearty farewell to everyone and get back on the road. Posted in Uncategorizedwith 2 comments. We like the way these two greet us, with a vigorous handshake and a great big smile, so we decide to accept the invitation. They live not far from the souq, and we follow them in our Emma as they wend their way through little village streets. Suddenly the road gets very tight and also slopes sideways, and going around a right hand bend we hear a terrible crunch: Emma has hit a stone wall at the top, due to the strong sideways camber of the road. Although our windows are incredibly strong, Emma having been a mobile bank in her former incarnation, the stone has won and there are shards everywhere, inside and out. Luckily it’s one of the smaller windows and, even more lucky, it’s the one behind the stovepipe, one we couldn’t really open anyway. And, amazingly, we’re right outside a campsite, so we make a quick decision to park Emma there and continue following Brahim and Ezzora before thinking about how to repair the window. After a 15-minute delay (mainly to calm ourselves down from the shock of damaging Emma) we arrive at their house. 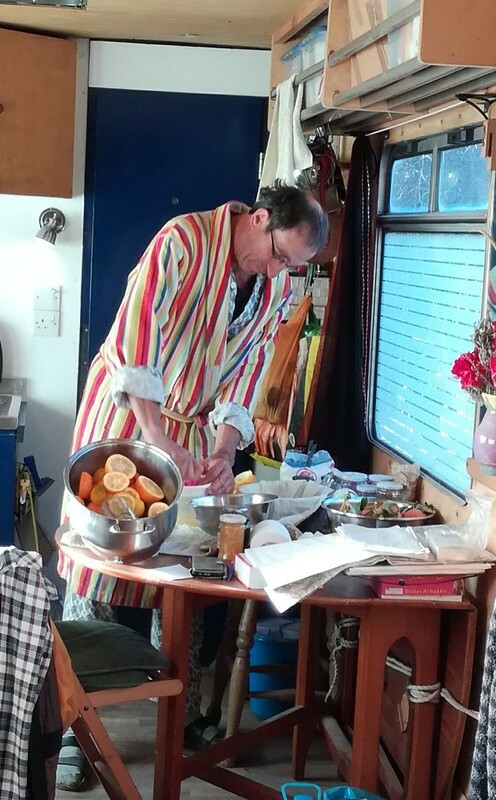 I don’t know how Ezzora managed to create a feast in such a short time, but we have a Moroccan salad, followed by potato chips, fried fish and lentil stew, then yoghurt, fruit and some incredible home-made biscuits. We want to learn how to make the biscuits and she wants to learn how to make Frank’s marmalade, so we arrange to swap cooking sessions: Marmalade making tomorrow, biscuit making the day after. This allows us to spend quite a bit of time with them, to get to know each other and ask more personal questions to gain an insight into their lives. We are intrigued to know how they met, having married only recently. Brahim describes how his uncle knew Ezzora’s family and mentioned her to him. One day, he took the initiative to ring Ezzora, just to talk to her. And what did Ezzora think when she was rung by a stranger? She says she liked his voice and was happy to hear from him. Their telephone calls continued for 2 months, each telling the other all about their lives. Brahim says he was very honest and explained his situation as a divorced man with two children, who his estranged wife wouldn’t let him see. 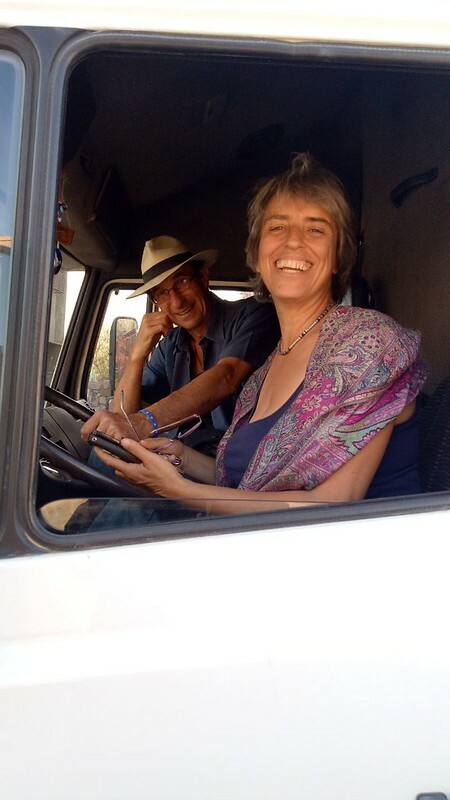 Ezzora comments on how she liked what she heard; she felt he was a kind and sensitive man and that she was lucky to have found him – or be found by him (Brahim translates what she says to us, with an exquisite mixture of shyness and pride on his face). Eventually, they agreed to meet in person and Brahim drove all the way to Casablanca to visit her. They spent 8 days walking around Casablanca and going to the cinema. After that followed several more months of phone calls, while they arranged their wedding. It was a small, private affair, not one of those huge Berber weddings like we had witnessed. And now, how does Ezzora like living in a small town, having spent most of her life in a large city? I ask. My home is wherever my husband is, she says, and there’s a lovely shine in her eyes. These two really have found each other. After a two-hour meal, Brahim absents himself for evening prayer, after which he invites us for a stroll in the fields by the river. We all go out together. Outside the door of the compound sit both their mothers, chatting with each other in the last rays of the evening sun. They seem to be getting on well. We get showered with kisses and blessings before we are allowed to continue our early evening walk. This little village houses about 80 families, each of whom has a parcel of land down by the river. It’s busy down there – mainly women at work – some harvest olives, others gather green fodder for their animals. There is a lot of merriment as we pass by. Maybe it’s a funny idea for those for whom walking is not a leisure activity, to see others out on a stroll. I keep trying to hit the cadence of greetings. They fire questions at each other: How are you, all good? Your mother, all good, your father, fine? Your family, your house, your fields? It’s happening in Berber and arabic at the same time and you mustn’t leave time for an answer. And when they realise we are foreigners, they often add French for good measure: ça va, bkhair, lebess? One evening, returning from our stroll through the fields with Brahim and Ezzora, we spot a whole lot of beehives and a man working by them. Frank and I drift off towards him but are called back sharply by Brahim – where are you going? to meet the beekeeper. Oh no, you can’t just go and talk to him! No amount of reasoning works, not even the fact that if we hadn’t done precisely that -walking up to strangers and talking to them – we’d never have met the two of them. Somehow, this is different though and it seems to be almost dangerous to just walk up to a man who deals with Bees. It’s almost as if he’s an outcast, but one that also imbues people with a healthy portion of respect, mixed in with a dash of fear. A few days later, we mention the beekeeper to someone else in the village and get a similar reaction. Bees are dangerous and beekeepers too, for some reason. We wonder if the beekeepers themselves maintain this image – it would certainly help keeping the price of honey so high. A pot of good quality honey here is up to 6 times higher than in Southern Spain. Of course partially this is also due to the fact that there isn’t that much honey around, what with the landscape being so arid. Just outside Brahim’s house, there is the local olive mill. 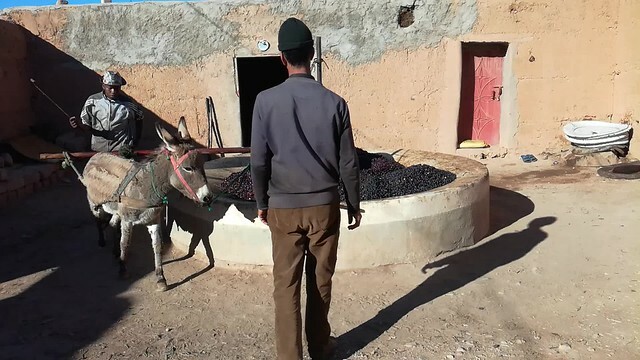 Each family gets a day or two allotted to bring their olives and with the help of a donkey, olive oil gets produced. This is not for sale, each family just produces enough for their own use, and no-one uses chemicals (famous last words. We just heard that many of the chemical fertilisers and pesticides that cannot be sold anymore in Europe due to tightening of regulations, go to places like Morocco where the rules are not as strict). However, after talking to the men at the mill, one of them goes back home to bring us a litre of the delicious green elixir. We are in luck once again – just a mile from the campsite is this week’s local Souq, so we’re off early for another Moroccan shopping adventure. This one is the most vibrant and diverse Souq we have come across so far, with many stalls of local vegetables and a great variety of produce. Frank finds more Bergamots than he can dream of and we sample a lovely fried fish sandwich for our breakfast. A local medicine man is advertising a magic muscle and joint rub. He’s an old man but he jumps up and down, bending in half and contorting himself to show just how effective this rub has been to his health. He sees me and seizes on my arm, the one where, in fact, I have a bad shoulder. He slides up my pullover and vigorously anoints my whole arm, instantly hitting on some quite sore points. After about 30 seconds of quite a violent but somehow oddly satisfying massage, he turns to the public and demonstrates just how soft my arm has become through his magic treatment, by flailing it about wildly. However, when he moves to bend it up behind my back, I call a halt. The whole thing is so quick, I’m a bit baffled by it all, though I have to say as I walk away, that my shoulder and arm feel quite good after the assault. This Souq has everything, from people sitting behind a little pair of scales selling saffron from a bag, all the way to a low-loader full of large tractors! On our way back to Emma, we pass by the shaman once again and with our last few Dirhams buy a little pot of the magic green ointment. Outside Emma, we meet Brahim and Ezzora, a couple who’ve been shopping for trees for their garden. We get talking and they invite us back to their home for lunch. It’s going to be a simple lunch, he says, just some lentils.